The latest smart speaker from Amazon is going on sale starting this upcoming Thursday, June 29th. Called the Amazon Echo Show, the device adds a 7-inch touchscreen and a number of new features that will help users take advantage of having the display. For example, when it comes to music controls, users will be able to see the lyrics of the songs they are listening to. The words scroll on the touchscreen as the tunes are heard on the speaker. The screen also displays album covers to help you make song selections. And to make sure that AI assistant Alexa always hears you, there are eight microphones strategically placed all around the device. Amazon has released a series of videos showing some of the features on its latest smart speaker. With the touchscreen, Alexa can show you posters of the current movies playing at your local cinema, along with the starting time of each flick. You can even request that the device play a trailer for one of the films right on your Echo Show. 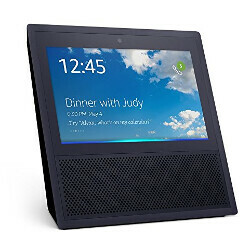 Other videos released by Amazon show the preparation of a shopping list using the device, how to set an alarm, and how to "hang" a do not disturb sign on your Echo Show. And while there is no video of this feature, Amazon's smart speaker can now help you monitor who is at the door by controlling a camera stationed at the front of your home. Currently, Amazon is offering a deal. Buy one Echo Show and get the the second unit for $100 off. The price for one unit is $229.99. To get the sale price on the second unit, you must use the coupon code SHOW2PACK at checkout. If interested, click on the sourcelink. So a Google Assistant with a bigger screen?